A backpacking rain jacket is basically a rain jacket that you might need while going on hiking trips, traveling or just going around town. These are usually made to be lightweight and compact too so that you can easily carry these around with you without having the weight burden you. If you’re in a hurry, here are our two favorite backpacking rain jackets in this review. The best backpacking rain jackets come in a variety of size and designs. The main purpose of a rain jacket is to keep you dry and safe. These are mostly reliant on the kind of fabric and lining used in it. Other than that you might as well get one that would look great on you. Why are Backpacking Rain Jackets Necessary? How to Choose the Best Backpacking Rain Jacket? Here are 10 best backpacking rain jackets that I loved and am reviewing it for you so that it would a bit easier for you. You might just browse through below and get an idea to what kind of jacket meets your fancy. The Marmot Men’s Minimalist Jacket is made of GORE-TEX® Paclite® Technology that keeps out the moisture and keeps you dry. This feature makes the jacket a great rain gear. All the seams are taped for better protection and rain friendly. This jacket is best suited for people who are dedicated to the outdoors. The adjustable hood and cuff further seals and protects you from the rain. Water resistant zippers and the front storm flap reduces vulnerabilities and provides ultimate protection. The front pocket holds your necessary and small items and keeps it at easy reach. Two side pockets add into your efficiency. Since it is an ultra light jacket, it serves you well for your backpacking trips or for traveling. The polyester shell keeps your weight down. Zippered underarm vent allows you to dump excess heat in case it tends to get a bit humid inside. The elasticated loop in the hood keeps it in place and keeps you secure. The high neck adds in to protect your face. The Outdoor Research Men’s Helium II Jacket is a waterproof rain jacket that is super breathable and incredibly light. What a great way to carry your rain jackets on your backpacking trips. It also packs downs to a small pack and weighs only 6 ounces. It comes with an integrated hang loop so that you can hang it to any of the hooks or just throw it inside along with your other backpacking gear. The jacket is designed with a streamlined cut and has an adjustable loop on the hips to keep it comfortable and protected. Adjustable loop on the head allows you to adjust it as per your need and elastic on the wrist keeps the wind and water from entering. The zippers are water highly water resistant and add on to keep you from the rain. There are no side outer pockets in this jacket but there in an inner pocket where you can keep your valuables and a chest pocket where you can keep your smaller items. The chest pocket is at a right angle where you can easily reach it. The Outdoor Research Women’s Aspire Jacket is made of GORE-Tex fabric that makes it extremely lightweight and waterproof. It is designed to keep you dry in long haul downpours. It packs up into a really small pack that can be easily carried in your backpack. The zippers in the front are two-way and waterproof making it comfortable to use. For better ventilation the Torso Flo technology allows you to open your underarm sleeve. This keeps you cool in case the inner jacket gets humid. This zippers can be fully opened from the waist to the biceps on both sides. You can wear it in a poncho style too. Two side hand pockets and a pocket on the left arm, all have a waterproof zipper closure. The hood can be adjusted and fit your head. You can also use the drawstring cord to cover the sides of your face. And the best part is that you can hide at the end of the strings inside so that it doesn’t come in your way or hit your face. High neck zipper gives you high closure and keeps you protected. It is a great and unique jacket. The Marmot Men’s Precip Jacket boasts the Marmot Nano Pro waterproof material that makes this jacket completely waterproof. This assures you that you remain dry inside. Further, all the taped seams make it completely waterproof. The inner material of the jacket is comfortable and doesn’t stick to your body. Having said that, it is also made comfortably to allow layering. The jacket is made in angel wing design so no matter how much you move, the jacket doesn’t rise with you as you move. A mesh pocket on the inside of the jacket stores the jacket when you pack it up. It is absolutely lightweight and weighs only 13.1 ounces. When it tends to get a bit humid on the inside, the underarm ventilation allows free airflow. To support that even the hand pockets are made of mesh so that you can allow further ventilation through it. The sleeves have a velcro closure to keep it fit. As for an additional highly useful part, the hood is stowable and can be easily stowed. And the hood also has adjustments to fit your head. Finally, the drawstring cord on the waist will keep you well fitted. The Columbia men’s Watertight rain jacket is a waterproof lightweight rain jacket. It is small and portable you can simply throw it in your backpack and you are good to go. It is made of 100% nylon and 100% polyester. You can be sure to be completely dry with this rain jacket. When your jacket is lightweight and waterproof you are sure to remain dry in almost all your trips, well that is if you carry these with you. The hood is adjustable and the drawstring allows you to adjust the hood easily and to keep in place. To keep you protected from the gusting wind, the front flaps over the zippers keep you protected and dry. Further, the seams are taped that ensures that you remain dry. The jacket is slightly bigger so you can also use it to layer, if add some layer inside then you can also use in the colder seasons. This will keep you warm. Velcro straps in the sleeves are designed with elastic to make it a lot comfortable. It keeps the heat from escaping and keeps you dry. It has 3 pockets in total, two hand pockets and a mesh pocket in the inner jacket. The inner pocket allows you to pack the jacket into a small carryable pouch. The super chic yet simple Columbia women’s Switchback is lightweight and portable. It is designed to keep you protected in case of a sudden downpour. You got to be prepared, right? It is designed to be super lightweight and packable. Just in case it tends to get too warm on the inside, the back panel vents will keep you cool on the inside. The sleeves are simple and give you a good closure. Two hand pockets are on the sides to keep you warm in case the weather is a bit cold on the outside. Waist drawstring straps to keep you adjusted and closed. It is a great jacket that you can also use it to your gym or just to get around town. but mostly it is a super saver to keep you dry and warm too. That is if you have layers on, on the inside. Comes with a wide range of soft and pastel colors. Because it can be packed into a small pack, you will be sure to use it because you will definitely carry it around with you. 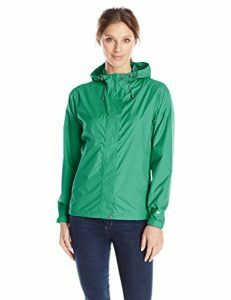 The Charles River Apparel Women’s New Englander is a lightweight and pretty cool jacket to be categorized as a rain jacket. It looks almost like a trench coat. This windproof jacket is lightweight and waterproof. It is lined with a grey mesh to provide better air circulation. The taffeta nylon sleeves make it easy to put it on and take it off. The front vented caps are designed for providing better ventilation. Even if it gets too hot on the inside you are bound to be breathing. This decreases the humidity inside. Two-way zippers give you more freedom and allow you to experiment with your style. The velcro straps on the sleeves keep you protected yet functional. It prevents the water from getting inside your jacket. With so many colors to choose from, you will love to experiment with your style and wardrobe. Two front hand pockets to keep you warm in case of the chilling weather. These pockets are zippered and covered with a flap for better protection. The jacket is slightly longer, it almost reaches your hips and keeps you covered and protected in case you move along or are into sports. The reflective accent on the front and the back will keep you safe in the dark too. The Gioberti Men’s Waterproof Rain Jacket is made of 100 percent polyester and is a pretty compact jacket that is designed to keep you dry, even in heavy downpours. It is made with the latest technology that wicks the moisture yet keeps you breathing. With fully taped seams, it not only keeps you dry but also makes the jacket long lasting. There is very less chance in the jacket that goes wear and tear. The mesh lining on the inside provides breathability and better comfort. It gives you a softer finish. It is lightweight and can be packed into a small carry pouch that you can take along and be prepared just in case. Also, you can simply drop it in your backpacks before you head towards your journey. The adjustable sleeves cuffs are a great way to keep you safe and completely dry. The internal hemline drawstring on your waist is to keep you comfortable. Two zippered hand pockets are covered with a flap and the main zippers are also covered with a flap. Both keeps the water from getting inside. It is a great way to keep you warm and dry. The hood cap is adjustable and closes with a drawstring. The Carhartt Men’s Rockford Rain Defender Jacket is made of 100 percent Nylon material and completely waterproof. It is a great way to keep your rainy day at bay and enjoy what nature has to offer. The fabric is water repellent, it is a great way to keep your clothes dry, internally and externally. It comes in four earth colors and is on the stylish side. The front zipper is covered with a flap to give you extra protection against the rain and the wind. It has two lower hand pockets and two chest pockets to keep your gear handy. Well, if you are not a fan of keeping things in your pocket, these make a great style statement. Well, what better way to keep your hands warm? I love it when jackets come with media pockets. The inner pocket comes with a loop that you can use to hang the jackets to your backpack or your jeans, simply use a loop. With 100% polyester lining, it is easy to put it on and take it off. It’s super sleek and attractive design look just as great. The White Sierra Women’s Trabagon Rain Shell Jacket is one of my favorite jackets because it serves both as a lightweight and waterproof jacket. The seams are fully taped to ensure waterproofing nature of the jacket. With an adjustable hood, use it to suit yourself. In case of a windstorm or heavy rainfall, just get your chin guard up and get going. The velcro can be used to adjust it. The Teflon fabric protector is used for waterproofing over the 100%polyester fabric. Most of the rain jackets are not made to be worn on a daily basis, these are mostly packed and put away and to be used when you may need them. But this rain jacket is attractive you won’t want to let go. Ventilated back panels to keep you breathing on the inside. The outer flap over the zippers to keep you better protected against the rain and the wind. And velcro straps on the sleeve will keep you protected against these elements. If you are looking forward to going on a backpacking trip then you must have considered a rain jacket. Because who know what kind of weather you will be up against? It is best when you keep yourself prepared. Backpacking rain jackets not only protect you from the rain, these also act as an outer jacket that will keep you warm in the inside sealing the body heat that you generate. Of course, you need to add in layers of clothes beneath. Choosing the best backpacking rain jacket is not that big of a challenge, it is just like looking for a jacket. But considering certain aspects and qualities of a rain jacket, if you stick to what you might need you can have a great rain jacket that will last you years. Needless to say, since you are looking for a rain jacket, you will have to be sure in the fabric. Don’t be misguided by water resistant jackets, these are entirely different form waterproof fabric. Look for waterproof fabric. A wide range of waterproof fabric can be available. Lightweight and good quality waterproof material will be long lasting but can be slightly on the expensive side too. Most rain jackets are made slightly larger and have angel wings too. This is because you are expected to wear it over a layer of clothing. So when you look for one, be sure on the size you may need. Small adjustments like the cuff Velcro, hood adjustments, vents, waterproof zippers, all should be considered while looking for one. The Marmot Men’s Minimalist Jacket has to win the best backpacking rain jacket slot. It wins for being so lightweight yet so chic and well designed. It is a great and stylish way to protect yourself from the harshest wind storm and the rain. Best suited for people like me who are built for the outdoors, this jacket serves well. The fabric and the zippers are waterproof making it more secure and safe. Since it is ultra light you are bound to carry it along with you in most of your trips and travelings. It is a great jacket.